2016-12-17 Winter has solidly settled in here in southeast Wisconsin. We've had several nights at or just below zero and several days that stayed below 20, today being one of those. It topped out at about +17. AND we've had three or more snow events leaving about ten or twelve inches on the ground. More is due tonight. I'm not THAT interested in winter hanging, so I rigged up some hangers in the garage where I can hang my hammock. It works quite well. The garage is detached (why would anyone build a detached garaage in Wisconsin?!) so gets pretty chilly. Of course if you make a way to hang your hammock, you have to hang it! So today, for the second time I decided to hang it. In part that was to try out my new Yukon Outfitters Kindle Hammock Under Quilt. On my December 12 hang in the back yard I used my DIY under Quilt made from a Costco Down Throw. It, along with lots of other stuff worked OK in the 35 degree temperature that night but it was kind of a hassle to set up. I've contemplated all sorts of things I might do to deal with that. But when I came across the Yukon Outfitters Kindle Under Quilt for a reasonable price, I decided to give it a try. Yukon Outfitters Kindle Under Quilt hanging beneath my ENO DoubleNest Hammock. Here it is hanging in the garage. It hangs nicely under my ENO DoubleNest hammock. It is very easy to hang, literally taking just a couple minutes or less. An initial lay in the hammock proved that it fits well. The only issue I see is that it is so narrow at the head and foot ends that if you try to lay digonally your feet are almost certainly going to overhang it leaving you with virtually no insulation under them. It measures almost four feet wide in the center when it is laid out on the floor but tapers fairly quicly toward each end. That makes it fit nicely on the hammock and if you like to lay straight, banana style, it would be perfect. But when you lay diagonally, it doesn't work so well. The problem is shown clearly in the photo at the right. As you can see, my feet overhang it considerably. Trying to deal with that, and lower its temperature rating I put the DIY Under Quilt between the Yukon Outfiters Kindle and the hammock. I think that helps solve the foot insulation problem but makes setup MORE complicated rather than less! So, I'm not sure if I took a step forward or backward with this under quilt! The temperature in my garage was 35 degrees. I didn't stay in the hammock for hours but after about a half hour I think the setup would clearly work at or below 35. Probably the Yukon Kindle would be fine for use when temperatures are about about 40 or above. I have to decide whether to keep or return it and try something else. But it was fun playing with it regardless of what I finally decide. 2016-12-03 For months now I've been "fixated" on hammocks, mosquito nets, underquilts, etc.. So, as my page on hammocks talks about, I acquired two Walmart hammocks, the Equip Travel Hammock and the Equip Mosquito Hammock. 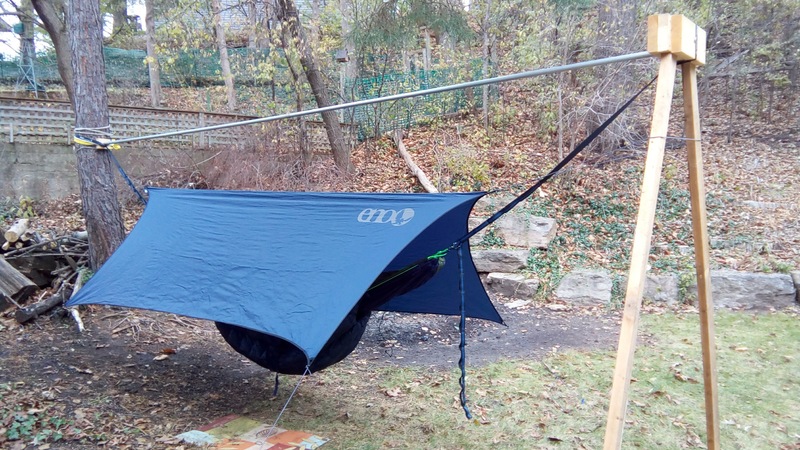 Also, having only one tree in the back yard that is suitably placed to use for hammock support I rigged up a "bipod" from old wall studs and some 2x6 scraps so I could actaully hang a hammock and play with suspension systems, underquilts and the like. And I've laid in both of those hammocks for a few minutes througout the past couple of months but never tried to actually sleep or overnight in them. But of course that is the objective! Then leading up to Black Friday REI started advertising a half off sale on selected items. "Just out of curiosity," I followed the link in their email and found myself staring at a nicely designed page showing the ENO OneLink Hammock Shelter System with DoubleNest Hammock. All for $108 instead of $220 that it normally sells for. A quick search with Google indicated that this really was a half off deal. I resisted for a couple days then clicked buy. It arrived this past Wednesday. It weighs a couple pounds less than the "package" I assembled with the Equip Mosquito hammock and is color coordinated to boot! 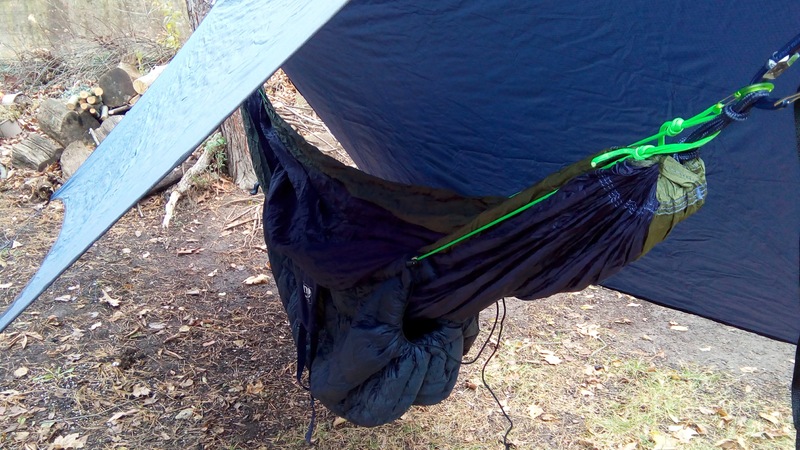 I was really proud of the Whoppee Sling suspension system I made for my Equip hammock but was also curious about the very simple Atlas Strap stytem that comes in the ENO OneLink package. Finally, watching the weather forcast a couple days ago it seemed clear that last night was going to be our last "mild" fall or winter overnight for some time, maybe until next Spring. So, Yesterday afternoon I decided NOW is the time to quit dreaming, joking and talking about spending a night in a hammock! The fact that I'm typing this today is proof that I survived! It was 34 degrees when I first climbed in at about 9:00 last night and 33 when I awoke for the fourth time and came inside at 5:00 this morning. I have to admit the bed inside was pretty nice! I slept most of the eight hours but was awakened or at least partially awakened by the neighbors dog, a whole host of sirens plus hellicopter (that seemed like it took special interest in my setup), the smell of a skunk, various car door slams, and similar things until about 1:00am. There was little breeze so, no wind chill to speak of. ENO OneLInk set up in my back yard. Close up of the hammock with DIY Underquilt hanging below. My setup consisted of the ENO DoubleNest hammock, ENO ProFly rain tarp, Atlas straps and my home made underquilt. I didn't need the mosquito net though it is included in the package. As the day wore on and it got colder I began worrying that my underquilt would not be adequate so I clipped a second Costco Packable Down Throw to my underquilt which is also made from one of those. Then, still being worried about getting cold I wrapped a Therma-rest Trail Scout sleeping pad in an old wool blanket from a local thrift store and placed it inside the hammock. For a sleeping bag (I don't have a top quilt - yet, I suppose!) I used the Everest mummy +5F/-15C Degree Sleeping Bag that I got from Walmart on sale for $24 back in August. Finally, I tied a ridgeline under the tarp to hang my eye glasses, small LED lantern and a couple other things. So, how did it go? Quite well, actaully. one benefit of having to get up multiple times to "take a leak" is that by about the third time you kind of figure out how to get back into the sleeping bag and make everything cozy fairly easily! I see now why many like a top quilt, as fiddling with the zipper on a sleeping bag is messy in a hammock. Next time, if there is one, I think I'll try using the mummy baq as a top quilt and see how that goes. Another observation is that though the sleeping pad definitely works, it makes it hard to get a good diagonal lay. I never felt cold on the bottomside (or topside for that matter) so, clearly my combination of everything worked. But I'm guessing I sacrificed comfort by going that route. 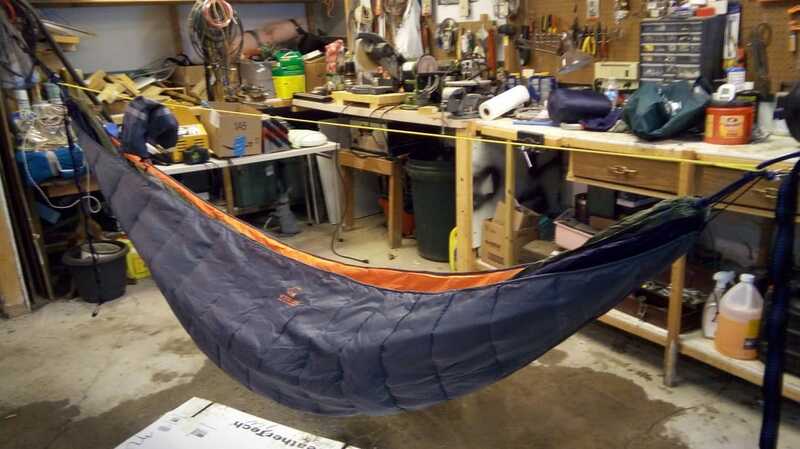 The sleeping pad also makes it difficult to get into the hammock because you have to try to keep it laying properly in the process. Speaking of the bottomside, my underquilt suspension needs work. I don't think it is tight enough for one thing. However it did stay snugged up against the bottom of the hammock. 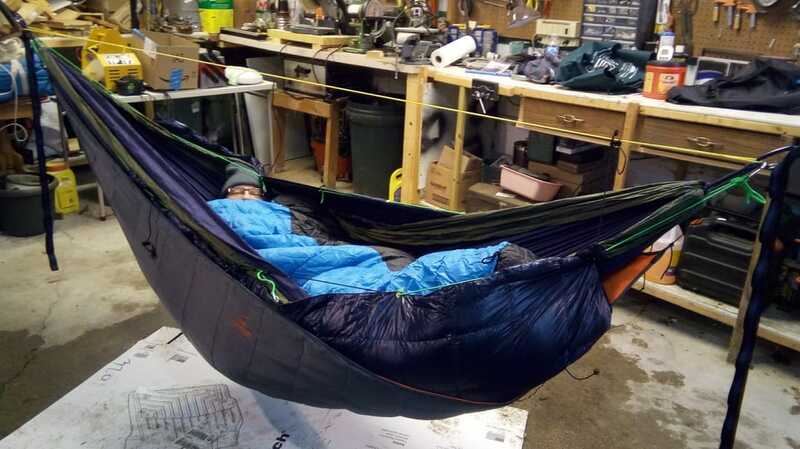 The foot end of the underquilt had difficulty staying wrapped around the hammock. But with two pairs of socks and my feet in the foot box my feet stayed warm. But I wasn't happy with the underquilt. I was happy with the sleeping bag. It is big and bulky but I was toasty warm. The only issue was with the zipper which is an issue with all sleeping bags. Once I discovered the velcro tab which holds the top closed it helped a lot. Without that it takes very little movement to start unzipping the zipper, letting cold air in around you neck and shoulders. The bag works. A hammock is just a hard place to do all the contorting you need to do to use a sleeping bag. Finally, I started the night with just long johns and hiking pants, a thin polyester long sleeved hiking shirt with a light weight Merino wool long sleeved shirt over that, a fleece balaclava, a pull over knit hat and a light weight pair of hiking socks with heavy wool socks over those. I might have been OK but when I got up at about 10:30 to use the privy I felt slightly cool so I slipped on a light down vest and never felt even a little cool the rest of the night. ​So, I proved to myself that I can do it! Don't know if I'll ever do it in winter again, but it was fun, even if I was NOT in the wilderness!